Last weekend I joined “La Traversée de Paris”, an incredible event where 700 classic cars get together twice a year and drive across Paris. Surely the best way to visit the city! We all met on the outskirts of Paris at about 7am. It was cold, damp, and more importantly still dark so I left immediately with the trusty Oppo Clio to go to the first step of the trip, up Montmartre. Montmartre is probably one of the most cliché places in Paris, but it’s also staggeringly beautiful, especially at dawn like here. Well I say dawn, but there wasn’t much sun to be seen at all even well pas sunrise. But I think that gave the scene even more character, as the first cars started to go through. I didn’t want to get swallowed up in the stream of cars, so after about half an hour I left Montmartre for the next stop, Les Invalides, via Arc de Triomphe (somehow empty for once!). Reminder: the Arc de Triomphe is HUGE. 4CV for scale. Some people were even having a bit of baguette breakfast on the back of a Citroen DS station wagon, just in front of Les Invalides. They out hon-hon’ed everyone. Next, just across the Seine and into Place de la Concorde. Paris is a small city by US standards, so most of the beautiful stuff is a few minutes away. Well, on a deserted Sunday morning, at least! Place de la Concorde had been transformed in a magnificent parking lot for the occasion, filled with both cars and people. All smiling, in the middle of Paris, can you believe that? Felt good to enjoy Paris with anything other than diesel smell around too. I much prefer poorly carburated fuel! But anyway, people started to move, either to get home or to finish the drive back to Vincennes, where it all started. I was feeling pretty sick by then, so I didn’t stay long in Vincennes. Fortunately I live pretty close! And most people didn’t make it back to that last stop, anyway. Some got directly home, so went to the optional luxury meal, and I’m sure many were still lagging behind by the time I got there. What a wonderful trip that was. I was blown away by all the cars - but I somewhat expected that. What I didn’t expect was to fall in love with Paris, even though I’ve sort of been living and working here for years now. It’s just neverending beauty. 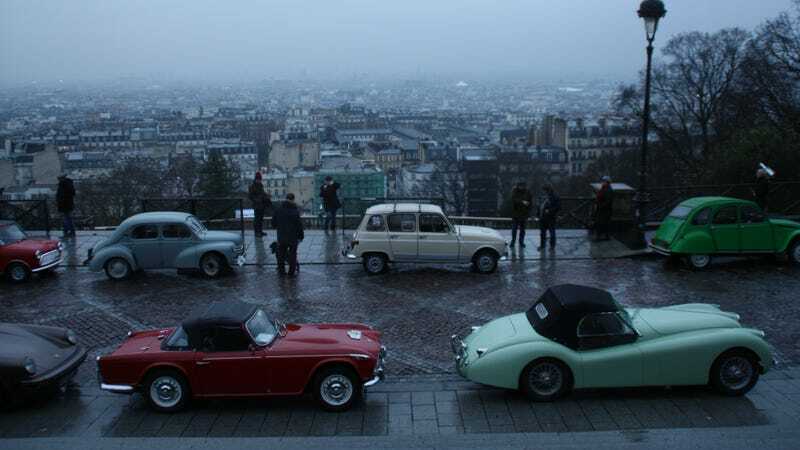 And witnessing it with hundreds of classic cars around, and seeing so many smiles instead of the usual Parisian shrugs, that made it even more special. If you ever get to visit Paris, try to do it during the Traversée. I promise you won’t regret it!